Home › Events › fcbd › Free Comics for the Euro Comics fans! Free Comics for the Euro Comics fans! Free Comic Book Day 2017 really does offer something for everyone – If you are into comics from Europe we’ve got you covered! The galaxy’s greatest Eisner-nominated SF anthology returns to Free Comic Book Day with a 32 page, 40th anniversary special. Judge Dredd is confronted by someone with a personal vendetta in Forty Years of Hurt from Matt Smith and Phil Winslade; the treacherous A.B.C. 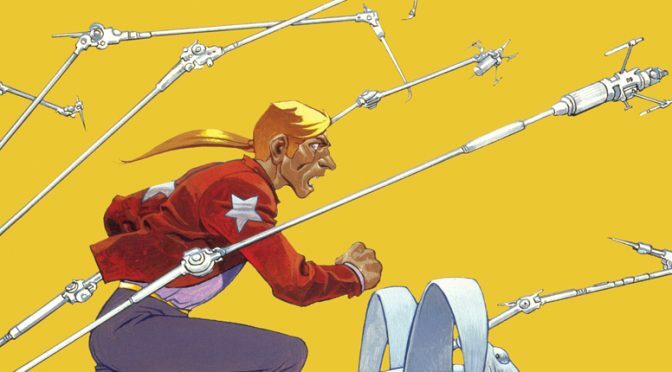 In its first ever FCBD offering, Humanoids presents one of the most influential and original comics in sci-fi history: The Incal . A full 30 pages of the seminal work originally published in Métal Hurlant and created by the artists’ artist Mœbius and the avant-garde director, writer, mime and spiritual guru Alejandro Jodorowsky. Tex gets a letter from the other end of the world sent by an Argentinian army officer asking him for help in an extremely sensitive mission. Tex chooses to help a friend, but situation quickly escalates forcing him to make a difficult moral decision. Don’t miss this international multiple-award winner! D+Q presents a giant sampler loaded with 64 pages of our most beloved comics for kids – delightful misadventures with Moomin and his family, strange and spectacular tales of Kitaro, and more hilarious antics from Anna & Froga. Arriving ahead of the July premiere of “Valerian and the City of a Thousand Planets,” an exclusive comic will be released on Free Comic Book Day, May 6 – though not officially a Diamond-sanctioned Free Comic Book Day release – featuring one of the stories that inspired Luc Besson’s sci-fi adventure. Free Comic Book Day 2017 is on Saturday, 6th May at Impact Comics. Doors open at 9am. per person limits apply, so bring your friends and get in early. ← What is Free comic Book Day?